Your FAV Bollywood Movie Outfits - We Found Them For You! We take inspiration from our favourite heroine’s dressing style all the time. Sometimes we knowingly want to copy the look and sometimes they make a particular look so trendy that we don’t want to miss out on it. We’ve picked up some iconic looks from our most loved bollywood movies and put together ten different options for you to choose from. From Deepika’s ornate Bajirao outfit to Priyanka Chopra’s chic jumpsuit, read on to find the exact replicas of these on-screen looks! We’ve been a fan of the wide-legged pants and palazzos for a while now. But a kurta that has a huge solid colour block in the prime? We had never thought we’d try that. This bold black and white kurta with the remarkable red outline, however, is definitely one kurta style we want to try! 6. Jacqueline’s Dress In Roy! Alia Bhatt surprised the world with her unconventional looks in this movie. From the different sarees to the girly outfits, she shone like the star she is. This bright saree was definitely a winner, considering she managed to dance in it so effortlessly. The colours, the gold and the vibe all will be completed when you also wear a dainty maangtika and toss on some bangles and jhumkis. 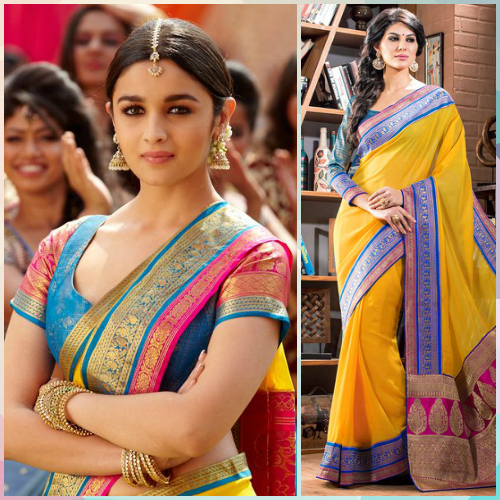 POPxo Recommends: Yellow Saree (Rs 3,044) Also read: 7 FAB Tricks To Style Long Kurtas If You’re A Short Girl! Deepika looked sprightly, gorgeous and adorable in this dress, dancing around to Matarghasti in a dreamy location. Now that you’ve got the dress and the kiss-printed shirt, all you need are the dance steps, which we’re sure you can easily ace! POPxo Recommends: Blue Dress (Rs 1,420), Kiss Print Shirt (Rs 760) Isn't this just AMAZING?! Get ready to look like your favourite Bollywood star now!